Albufeira is the most loved beach resort in the heart of the Algarve - Portugal. The villa is in walking distance of all the facilities and located in a quiet zone with little traffic. The wide sandy beaches of Forte de Sao Joao at 400 meters. On a short distance of 1000 meters, you find the; Old Town with picturesque ( car free ) shopping streets, famous night live street "the Strip" , park, restaurants, The pubs and several other beaches. A supermarket is at 600m. Also close to the Marine, from where several boat trips are organized. The apartments are full equipped, with air conditioning / heating system, satellite TV, DvD player, radio / CD player, washing machine and a nice open kitchen. From terraces, direct acces to the pool with sun beds and a royal garden with palm trees. A barbecue standing next to the spacious terraces, for all your grill activities. Albufeira is a nice place to discover the Algarve. You have easy access (by bus or car) to Lagos, Portimao, Vilamoura or several golf courses. 1 - Good quality for a nice price. 2 - Fully furnished apartments, with a swimming pool and nice garden. 4 - Satellite TV, DvD player. 7 - Well maintained, clean apartments with sufficient towels and linens. 8 - Central location (walking distance) of all facilities, 400 meters to the Beach. 9 - Located in a quiet residential area, where you can relax and sleep peacefully! 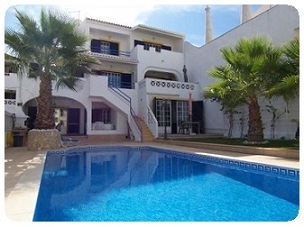 10 - Close to the airport of Faro, just 40 minutes transfer time.